Video is more personal than texts and stills, it affects us and our feelings much more. Video is very efficient for learning, explaining how things work. When was the last time you watched a 15-minute clip of someone talking? For many types of video clips or TV shows etc, these drawbacks are not too important. But for example a long video lecture or interview often feels too time-consuming to watch for the above reasons. 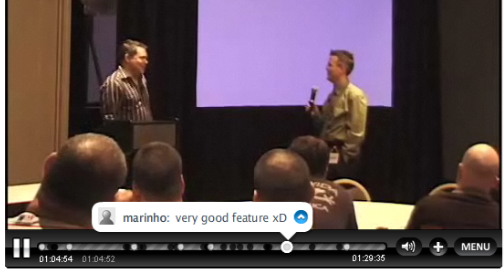 Viddler is a video service that offers both tags and user comments in the video player. Point to the white dots to see the comments and the black dots to see the tags. The tags are also automatically gathered in a separate tag cloud, so that you can search inside all the videos that contain a certain tag, very smart! 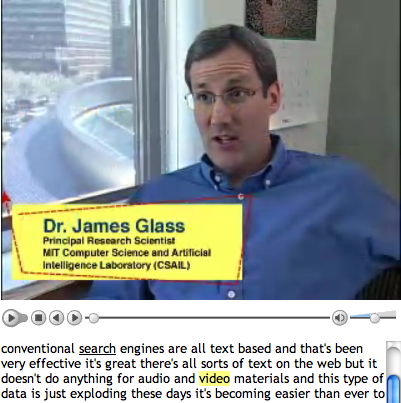 MIT’s lecture browser is a web interface to video recordings of lectures that have been indexed using automatic speech recognition technology. You can search for topics and play the video starting at the relevant point and see the synchronized transcript. As you can see, the transcript is not perfect yet, but it is certainly good enough to get an overall impression of what the lecture is about and search for the most interesting part of it. These are just two examples of new, smart functions that empowers internet video. There are many more already, the future of internet video has just begun, so stay tuned! Interesting post Henrik. Let’s hope more media players start using these kind of features. Unfortunately I think they have a long way to go.